This post is an in-depth review on FreshBooks, based from my own experience and use of the invoicing and accounting software. Here I explain why I began using the software, how I use FreshBooks for my own online business, the benefits of using it, and how you can use FreshBooks to assist and better your own business. When I first started my online business almost two years ago I quickly became overwhelmed with trying to keep track of my revenue and expenses, especially my expenses. Starting out, I neglected to properly organize and record all of my business expenses, a rookie mistake on my part. Back then, I didn’t realize the importance of bookkeeping, such as logging and organizing the expenses related to my business, and just assumed I could simply remember all of my expenses by memory. It was a combination of laziness and perhaps ignorance. Since this was my first business, I was only focused on the product portion of my business and not the finance portion, which became a problem when tax time came around. About two months after starting my business, I began to realize just how unorganized my business finances had become. I had no clear idea of how much money I was investing into the business or how little revenue I was generating at that time, which was coming in from multiple sources. My finance aspect of my business had become so unorganized it was chaotic. This was an absolute horrible way to run a business, especially for a person who majored in business and accounting in college, I should have known better from the start. I decided to emphasis on my college education and hone in on my accounting skills. I began making spreadsheets in excel and documenting my revenue, expenses, and the other financial aspects of my business this way. By doing this, it greatly improved and helped organize the financial documentation of my business. At the same time, it also proved to be time consuming and repetitious work to keep my spreadsheets relevant and updated. Many times I would forget to enter in an expense or would simply procrastinate and put-off updating my excel spreadsheets. Many times because I was too busy focusing on the other aspects of my business. I eventually found out about FreshBooks, which is an online invoicing software tailored to meet the needs of small business owners and freelancers. I had heard good things about them from other business owners who used them for their own business in my industry and decided to check the software out. I quickly became intrigued with all the good reviews I saw about FreshBooks and how many small business owners like myself were also benefiting by using it. I decided to try them out, and quickly signed up for their free trial and began using the software. Normally I’m a bit hesitant about “free trials” as they usually require a credit card, but luckily for me FreshBooks didn’t require a credit card or any type of payment service to sign up for their free trial. So there was no financial liability and I didn’t have to worry about canceling the service before the trail period ended if I decided I didn’t like the service or if it didn’t fit my needs. I was super surprised and happy about how easy and fast it was to sign up for the FreshBooks free trail, it literally only took a minute and because their online platform was so simple to use, a minute later I was instantly importing my old excel business spreadsheets and connecting my business financial accounts to it! Okay, enough of my jibber jabber, it’s time to get down to business! The following is my honest review of FreshBooks, which is based from my personal experience with using the online invoice and accounting software, and how I use it to keep my finances and expenses organized for my online business. Enjoy! FreshBooks is a cloud-based invoicing and cloud-based accounting software for business owners and freelancers that run a service-based business. The program is a convenient and secure way for business owners to meet the everyday needs of accounting and invoicing, as they always have full access everything online and in the cloud. FreshBooks allows its users to create their own invoices, track their time, bill their time, and has some outstanding project management tools. They also make it very simple to manage your team members, view and organize client lists, send and sync business reports with your accountant, keep accurate bookkeeping, collect payments, manage expenses, and much more. Their program does a lot and if you’re a small business owner it will easily meet all of your everyday needs. They’re also continually improving their service while keeping its simple ease of use, to increase the benefits of using it and to make running your business easier. After I signed up and started using FreshBooks, I really liked the fact that you could customize your invoices and make them look very professional by adding your own business logo and brand colors, and then send them directly to your client’s mailboxes or inboxes. Whether you’re a business owner, freelancer, blog owner, or just run a small side hustle, FreshBooks makes it very easy to get paid and send invoices to customers and clients. If you’re a freelancer or small business owner, you’ll quickly notice the many benefits that come along with using FreshBooks. I’m really glad I decided to sign up for their free trial and try them out, as I was amazed at the programs ease of use, simplicity, and effectiveness. Normally, when I first start using software or a program that I never used before, there’s generally a learning curve. What I mean by that is it normally takes some time for me to learn and get use to a program when I first begin using it, which can be time-consuming and inconvenient. Fortunately, this wasn’t the case with FreshBooks. Soon after I signed up for their free trial and logged into my dashboard, I instantly began syncing all of my business financial accounts and uploading my business .CSV files. It took me literally no time to learn how to use the program, everything was very clear and laid out in front of me, and I knew exactly where everything was. The simplicity of the program is truly a huge benefit for anyone, especially for freelancers and small business owners. Besides its simplicity and ease of use, there are many other ways for small business owners and freelancers to greatly benefit from using FreshBooks. In business, time is money, and let’s face it, there never seems to be enough time to get everything done that we want to get completed. FreshBooks understands the value of your time and has incorporated it into all aspects of its cloud-based software, including its invoice feature. When you use FreshBooks you’re able to create a professional looking invoice in less than a minute. 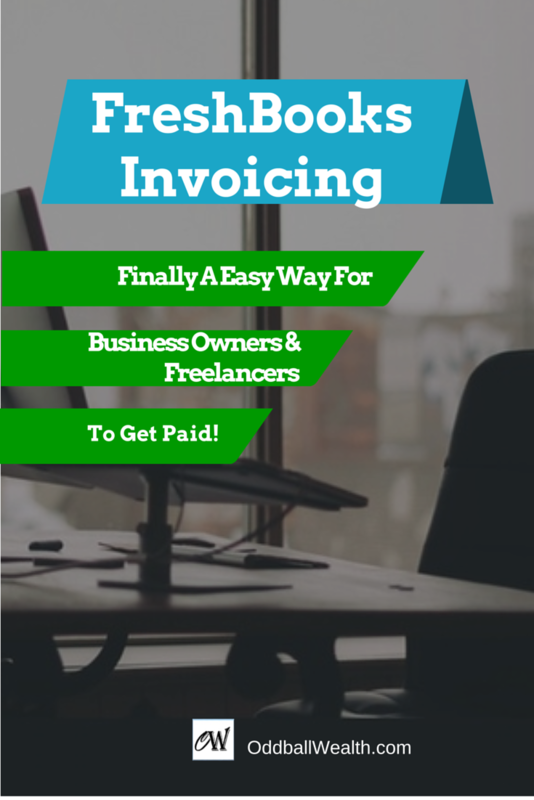 This is a huge benefit to anyone, especially if you do many invoices daily! To make your invoices look even more professional you can add your own logo as well. Once you quickly create an invoice, you can immediately send it as an email, print it off, or even download it as a PDF file. You’re also able to accept credit cards on your invoices, and create a quote or estimate. As a business owner, I want to make sure my clients and customers receive my invoices and view them. When you use FreshBooks, you’ll know immediately when an invoiced is viewed and also when they’re paid. This allows you to constantly know what’s going on, which invoices have been viewed, and what ones have been paid, and which ones haven’t been paid! For clients who buy your services or products continuously, FreshBooks allows you to send recurring invoices to clients, which is another huge benefit and time saver. Your most valuable and limited asset is your time, and FreshBooks allows you to easily track all your time spent on projects and jobs. This is a huge benefit, as it allows you to know exactly where you’re spending your time, what you’re spending your time on, and more importantly where you’re wasting your time. You’ll be able to determine how much time your spending on certain tasks and clients, from which you can easily determine whether you’re charging enough for certain projects or tasks based on the amount of time you’re spending on each one. If you have an accountant or bookkeeper, you can allow them access to your reports in FreshBooks. You can provide you accountant with their very own login information, which you control what they can view and have access to. You can choose to give them access to view your clients, reports, invoices, etc. FreshBooks can be used and integrated with other accounting and invoicing programs like QuickBooks, Xero, and others. It can also be used with other types of tax and payroll software or programs. You can also sync FreshBooks with your Gmail account and many other accounts, such as email marketing accounts like Mail Chimp, to get a full overview of all your business accounts. To few a full list, check out their site to see all of the programs additional add-ons. One feature I really enjoy about FreshBooks is how I’m able to sync all my financial accounts, and instantly view my expenses and transactions. I synced my business checking account and business credit card account with FreshBooks, which syncs all my transactions made in those accounts and allows me to quickly view all my expenses to easily put into my accounting reports. This is very helpful for any business owner or freelancer, as it allows them to quickly see if their business revenue is covering their expenses, and whether or not profit is being made. You can use FreshBooks to quickly create an estimate for a client anywhere. Just simply log into your FreshBooks account, click the “estimates” tab, and you can create a new estimate. Pick the client you want to create the estimate for, put in the information for the client and job, track the time of the project or job, and once they’ve accepted your terms you’re able to instantly send them an invoice. This review wouldn’t be complete without going over FreshBooks pricing plans. To really understand whether FreshBooks is right for you and to get a feel for their program and invoicing software, I recommend you do what I did and try FreshBooks 30-day free trial. Sprout Plan: This plan is only $12.95 per month or $11.66 a month if you pay for it annually. Under this plan, you can make and send unlimited invoices and even use your own logo, but you can add up to five clients at a time under this account. You could always remove one client to add another, or upgrade your account at any time as your business grows. Seeding Plan: This plan is $19.95 per month, or $17.96 per month if you pay on an annual basis. Under this plan you’re able to manage and bill up to 20 clients at a time. Evergreen Plan: This is the most popular plan for FreshBooks users. It’s currently $29.95 per month, or $26.96 per month if you pay annually. Under this plan you’re able to manage and bill up to 200 clients! Mighty Oak Plan: This plan is for larger and established businesses and freelancers. It’s only $39.95 per month, or $35.96 per month if you pay annually, and you’re able to manage and bill an unlimited number of clients. You can even add a staff member to this account, and also track and view the amount of time your staff member spends on jobs and projects. Should You Use FreshBooks For Your Business? FreshBooks has one huge advantage and benefit, but that advantage is also its small drawback, which is that FreshBooks is completely online. This is nice as you’re able to login to your account and use FreshBooks anywhere, whether you’re at home, on the go, at the office, or at a client’s project or job site. Since it’s only online, this is also its drawback, as you can’t download it to your desktop and need an internet connection to use it. Although, in our modern and tech savvy world, this isn’t much of a drawback as the internet is with us just about everywhere we go. The internet is on our phones, in our homes, available at businesses, in coffee shops and hotels, it’s just about everywhere. For myself personally, my entire business is setup and conducted online. So this is certainly not a problem for me. I can confidently say that FreshBooks is by far the best invoicing and bookkeeping software I’ve ever used. I would recommend them to all business owners and freelancers out there. Try FreshBooks for free now, to get your finances organized and start getting paid! This sounds awesome! Finding the right invoicing software and learning how to navigate it can be tricky, but resources like this make it much simpler. Thanks so much for sharing this helpful info! Thanks Morgan and you’re welcome! Yes, it can be a difficult tasks finding a good invoicing software, but I’m truly impressed with FreshBooks and definitely recommend them to anyone to try! A perfect example for a well performance output in a business is a good division of labor which management softwares can provide. Today’s businesses are unrecognizable from those of fifty, even twenty years ago. This is mainly due to an increase in business software that has led to further integration and efficiency.